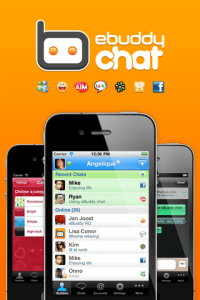 eBuddy: Chat on AIM MSN / Windows Live Messenger, Yahoo, Facebook Chat, GTalk, MySpace Hyves and ICQ. eBuddy is one of the largest Instant Messaging services in the world, with more than 30 million users worldwide! We are constantly working on improving our apps, so stay tuned for updates and new features! Meanwhile, please help us improve our app: Share your feedback in the ‘Tell us what you think’ form in the app, or send an e-mail to feedback_iphone@ebuddy.com.